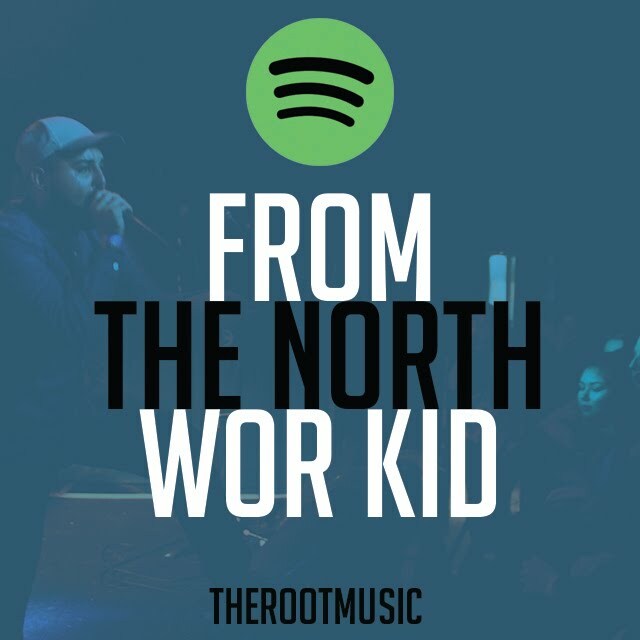 In our latest playlist TheRootMusic brings to you the biggest and best UK music coming From The North Wor Kid. You can stream from Spotify below or click here for Apple Music. We couldn’t not have the greatest grime banger of all time Spit One Lyric from Eyeconic. We also feature a load of artists who played at Evolution Emerging including the aforementioned Leddie MC alongside Reali-T & Naughty40, Zico MC, Cheidu Oraka and E-Mence (who joined Listaa‘s set alongside Claymore and 90BRO (DJ)). We have also playlisted the new singles from Jamilah, NE Dons, Endem and RoninClan. In the Spotify edition we have Noble‘s Lone Soldier but unfortunately the track isn’t currently available on Apple Music. We have one of the best tracks from Lunar C‘s Dirtbrain album, the single from Ceiling Demons vinyl release of Nil and having caught them performing it live at In The Mix #2, Komparrison‘s McDonalds Drive Thru also makes the cut. The playlist is rounded up with new singles from Dylan Cartlidge, Martha Hill and Sam Fender. Newcastle, Sunderland, Darlington, Middlesbrough, Manchester, Hull and Leeds are each represented on the From The North Wor Kid but we’re looking for anything from Sheffield upwards including Liverpool, Blackpool and more. Get in touch @_TheRootMusic on Twitter if you want to pitch your release for From The North Wor Kid. Posted in UncategorizedTagged 90BRO, Ceiling Demons, Chiedu Oraka, Dylan Cartlidge, E-Mence, Eyeconic, Jamilah, Komparrison, Leddie MC, Listaa, Lunar C, Martha Hill, Naughty40, NE Dons, Noble, Prose, Reali-T, Ronin Clan, Sam Fender, Shakk, Shotty Horroh, Zico MCBookmark the permalink.